Add KWISP digital phone service to any wireless Internet package for $20/month (plus tax). Additional charges apply for taxes, operated assisted calls, collect calls, and calls to directory assistance. We only charge for actual taxes, not regulatory recovery and other phony fees. For planning purposes, state and local telecommunications taxes will total around $1.50/month in unincorporated DeKalb and LaSalle counties, up to $2.20/month in towns that have municipal telecommunications taxes. We provide an analog telephone adapter so you can use regular corded or cordless analog phones (the adapter must be returned if you cancel service). Businesses and people who work from home may want to consider digital IP phones for the improved performance and features compared to analog phones. There are also IP/DECT cordless phone bases that support from 5 to 9 cordless handsets. Calls to 911 may be handled differently than a landline phone. We will register your street address in the E911 database, and you should notify us any time you move the phone adapter to a different location, to avoid emergency responders being dispatched to the wrong address. Digital phone service requires power and a working Internet connection. If you need phone service during a power outage, consider purchasing a battery backup unit. This service may not work with certain FAX machines, alarm services, etc. Not for commercial use or resale. Not intended for "high risk use" where interruption of service can result in personal injury or damage to property. * Phones are provided by customer. Compatible with most popular SIP phones, for example Cisco SPA5xx series, Grandstream, Yealink. 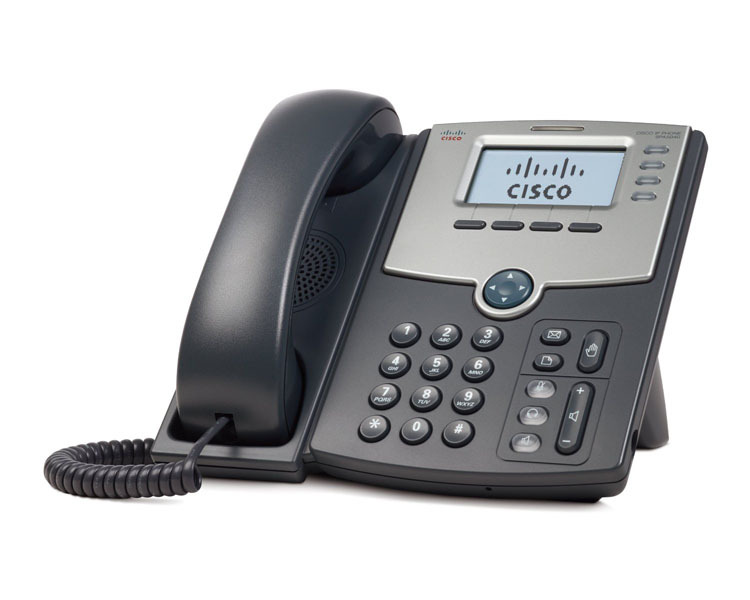 Cisco SPA504G is a popular 4-line speakerphone with LCD display and softkeys.